Michelle Smith, 20, is the focus of the documentary Three Days to See, which was inspired by a Helen Keller essay about what Keller would like to see if given sight for three days. “It uses blindness as a metaphor for how we all lose sight of what’s important,” says Jeff Migliozzi, Michelle's teacher at the Perkins School for the Blind. Michelle was born blind, has Asperger’s syndrome and left her home in rural Maine to be a student at the Perkins school in Boston at age 14. “The movie is about passion,” Michelle says. “It’s about liking what you like, trusting your own voice and not letting your disabilities dictate what you should be passionate about.” Three Days to See is trying to raise funds to ensure its footage moves into post-production at Kickstarter. I spoke with Michelle. BLOOM: What has been most challenging for you growing up? BLOOM: You mention in the film’s trailer that you have good ideas and opinions, but people don’t listen to you because of your disability. How do people react to you? Once people get to know me, they realize not only is she blind, but she has this other problem too, and they don’t know how to deal with me. It’s hard. They feel they have to walk on eggshells around me. I’d rather they ask me questions than pretend the Asperger’s doesn’t exist or treat me like the elephant in the room. I have one really, really close friend who is also blind. We’re in a similar position where we’re both stuck in our house most of the time. I graduated last June and live in Maine with my mother. It’s snowing and I find it hard to manoeuvre with snow banks so I stay in my room a lot of the times. We’re both bored so we call each other up on Skype. BLOOM: Tell me about Three Days to See. Michelle Smith: The themes revolve around Helen Keller’s essay Three Days to See. It’s about being passionate about what you like and not letting your disabilities dictate what you’re passionate about. Even though Helen Keller can’t see, she understands art. And even though she can’t see or hear a play, she understands it and is passionate about it. It’s the idea that anyone can appreciate art and theatre, and not having that level of exclusivity that is so common in our society today. In the movie, I go through many stages of interests. When it starts, I was interested in anime. Then halfway through I went through a big phase when I was playing minecraft. And now that the movie is almost done and being created, my obsession is Daria on MTV. It’s an older show from the 90s about a teenager who wore glasses and was disenfranchised from youth culture and sarcastic and funny and awesome. It was a cartoon and the opposite of most stuff on TV. 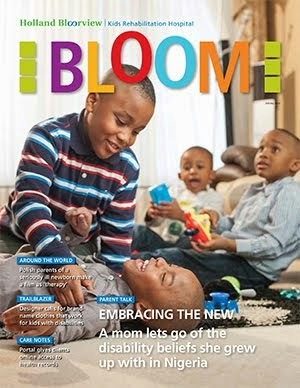 BLOOM: What kind of impact do you hope Three Days to See will have? Michelle Smith: It’s about looking at people as people, and not seeing people as their disability or as a personification of their disability, or as a personification of a stereotype. In the film I say ‘This person is just like me—only different’ and the point is that everyone’s like you, in terms of their hopes, dreams, fears and anxieties, even if they don’t show it. The movie isn’t about being sighted or blind per se, it’s about treating people like people and trusting your own voice and thinking twice about having preconceived notions about someone. If I affect one person’s perception of the world and how they should view other people I’ll view this as all worthwhile. One of the reasons I like Daria is there’s an episode where she decides ‘I won’t wear glasses anymore’ and she wears contacts but the next day she can’t put them in because her eyes hurt so much. So she doesn’t wear either and she’s stumbling around, because she’s vain, but eventually she realizes it doesn’t matter. She’s talking to her best friend Jane at the pizza parlour and she says: ‘When I take my glasses off and look in the mirror I can’t see a thing. And when I put them back on I can see things that other people can’t see. I can see better than other people, so who cares what people say about me and my glasses.’ And then her friend Jane says: ‘You aren’t talking about eyesight anymore, are you.’ And Daria says ‘No, I’m not.’ I’m like that. I can see things other people can’t. BLOOM: I would imagine that being blind is an advantage when getting to know someone in the sense that you don’t judge people based on appearance. Michelle Smith: I’m thankful that I don’t judge people on their looks. I think if I’d been born with full vision and no Asperger’s syndrome I would have grown up to be kind of shallow. When I talk to people I don’t care what they look like, what clothes they wear, what race they are. I just want to talk to them because they’re another person. I can learn something new about their experience and there’s so much for me to learn. I don’t understand people when they’re passive aggressive or don’t say what they mean. I can’t read between the lines. These aren’t always things I want to learn about the human experience, but they’re things I have to learn to survive. BLOOM: What are your dreams for the future? Michelle Smith: I write fan fiction and I think it would be cool to be a writer of original fiction. But I’m practical, so I think I’m going to go to college and pursue publishing and then I can resume my writing on the side. BLOOM: What is fan fiction? Michelle Smith: Let’s say you love a book series and you’ve read all the books and seen the movies and you want more. You go to a fan fiction website and there are thousands of stories—some as long as novels—about the characters and situations but not written by the author, written by fans. I write and read Daria fan fiction a lot. I can't wait to see this documentary. Health: Does it come in all shapes and sizes?